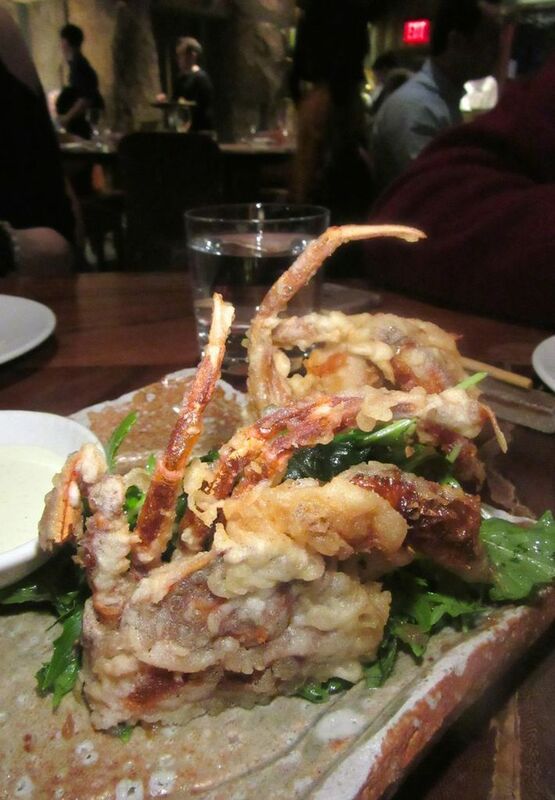 Crisp shards of dried fish skin is the not-so-amusing amuse at that first dinner. Simon & the Whale combusts midway through my first evening there. Gabriel Stulman’s midtown effort in a glassed-in corner of the Freehand Hotel in Flatiron is already crowded and noisy. 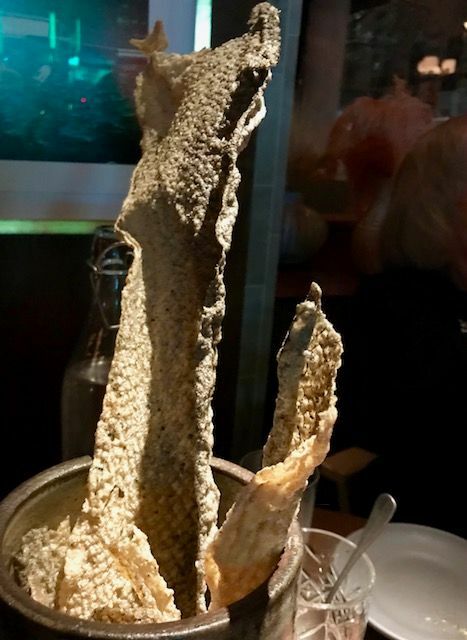 The Village restaurant eminence has stopped by to explain the exotic shards of fish skin standing tall on our table. Gabriel Stulman discoveries we’re here and tells why it’s Simon not Ahab. His new baby boy. I’m not here because I’m a big Stulman fan. 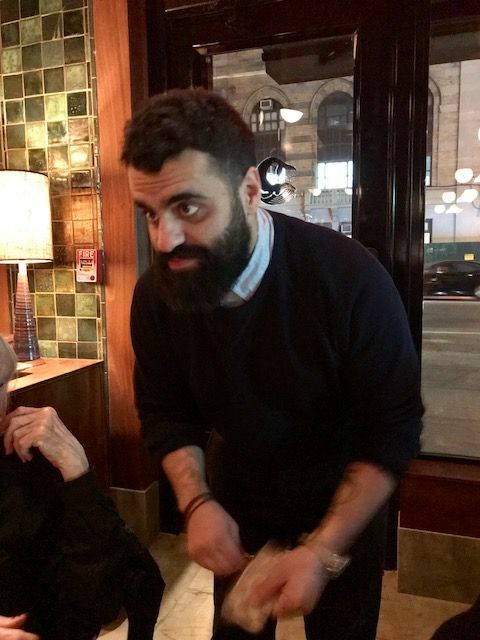 I think I went to his Bar Sardine once and never wrote about it. It is the whimsy of the restaurant name that draws me. The place is named Simon like his new son, he responds when we ask why it’s not Gabriel and the Whale. Or Ahab. 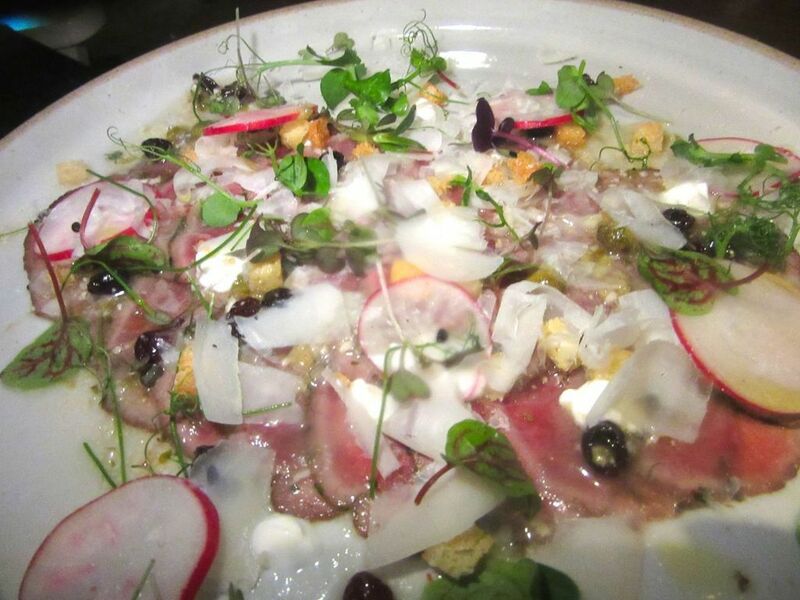 Raw lamb dotted with Sardinian goat cheese, currants and rosemary yogurt is a hit with our table. Goat cheese and soppressata sausage are tossed with meyer lemon in the shaved salad. I’ve already fallen for the lamb carpaccio with goat cheese and the marvelous barley black bread served with seaweed butter. “We bake all our breads in house,” Stulman confides. 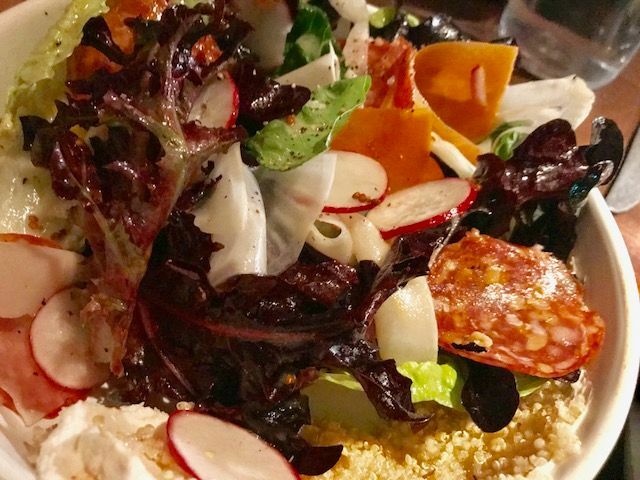 Our foursome divides the shaved salad with goat cheese and soppressata sausage, too, and squid confit with smoked mussels, black barley and beech mushrooms. 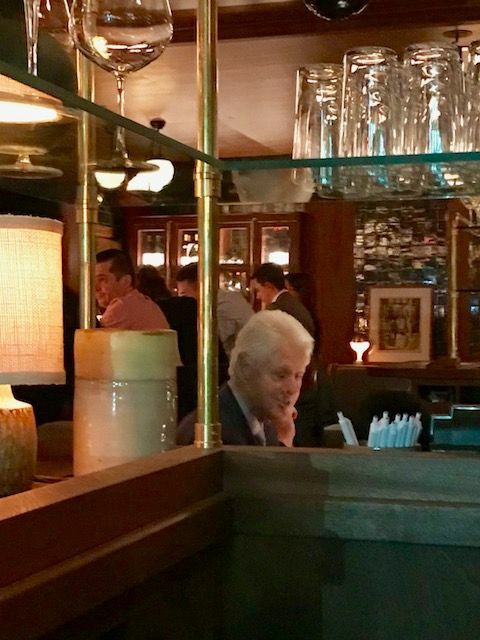 All eyes refocus, the slim celery-eating Bill Clinton has just walked in with friends. 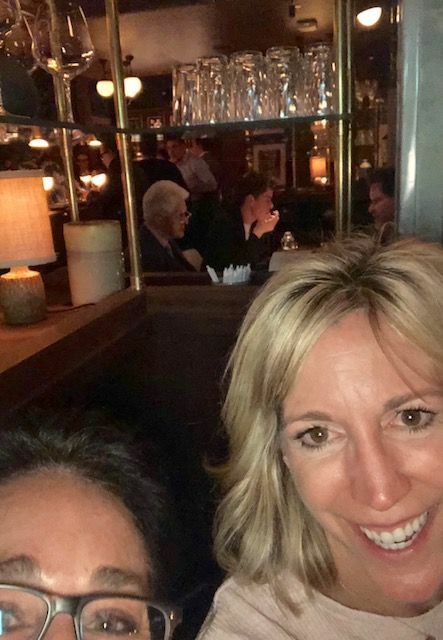 My niece Dana Stoddard takes a selfie with her friend to catch Clinton in the background. And then Bill Clinton walks in. Two of my companions squeal and excitedly negotiate a dual selfie with him in the background. I’m behind a pillar that hides his table. “He’s looking thin and almost fragile,” another companion observes. 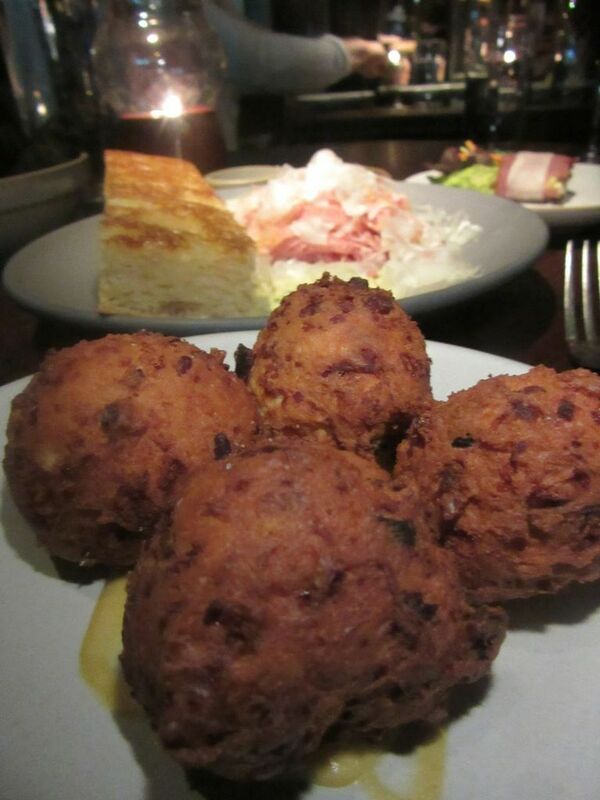 The bacon and smoked-gouda-stuffed zeppole are a savory starter to share with drinks. “He’s eating celery,” my niece Dana reports. While she and her friend Nancy are distracted, I take more than my share of the raw lamb tendrils dotted with Sardinian goat cheese, currants and rosemary yogurt and the last fried zeppole ball infused with bacon and smoked gouda. 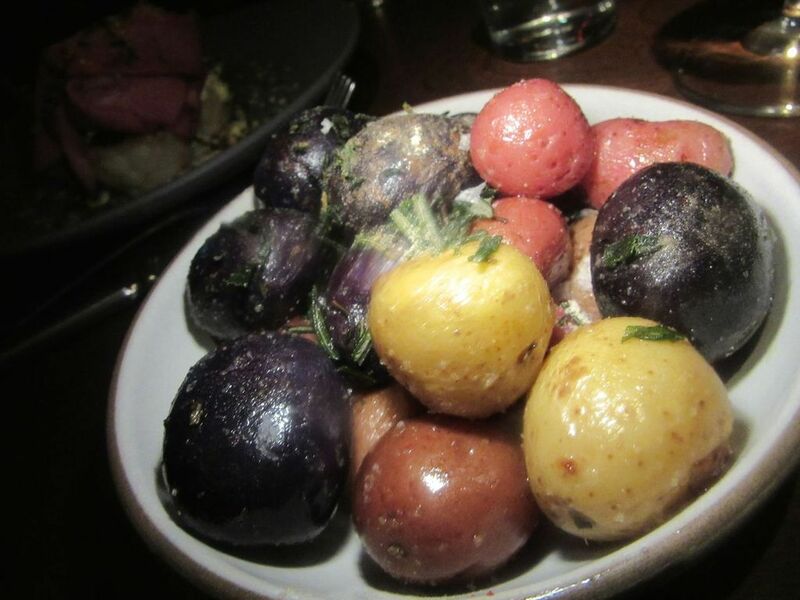 The $9 side of roasted potatoes comes in all colors with rosemary and aioli. 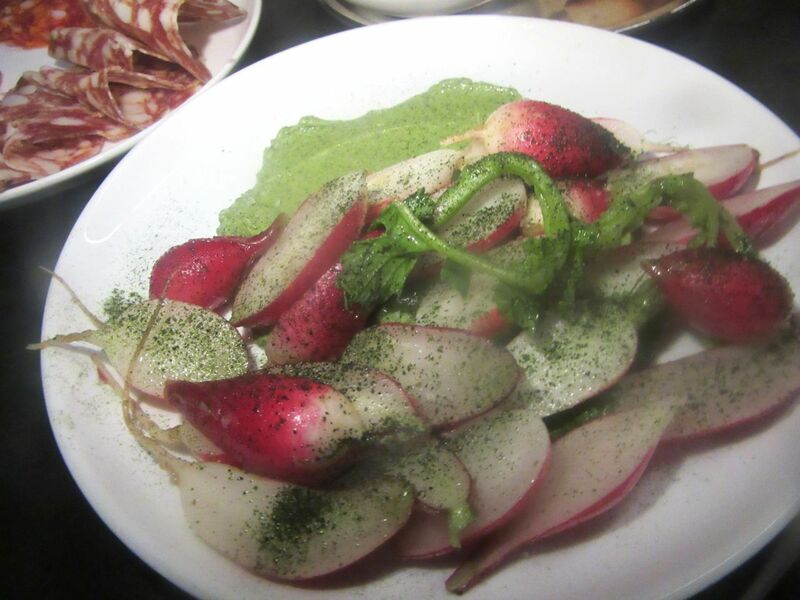 “We could send him this broccoli rabe with anchovy and pickled onion,” I suggest. I seem to be the only one eating the other small side, Technicolor roasted potatoes with aioli. 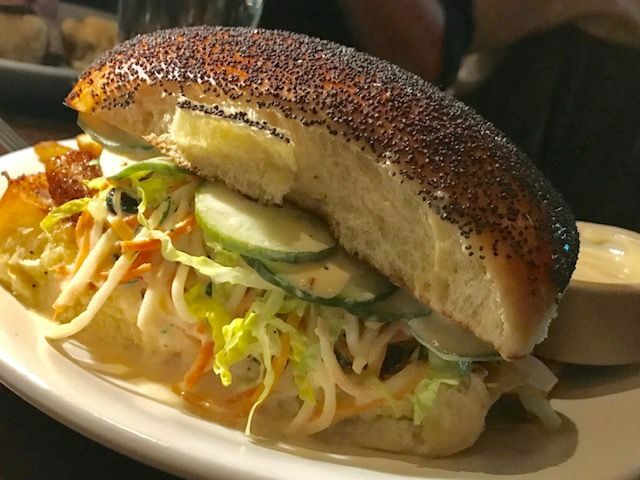 The fried fish sandwich layers a battered cutlet with cole slaw and Dijon mustard on poppy seed challah bun. Dana is distracted from her fried fish sandwich painted with Dijon mustard and stuffed with coleslaw on poppy seed challah. I slice off an end for myself. We’re also sharing cauliflower with veal tongue pastrami and a piquant sauce gribiche, and the sunchoke pasta with spinach, walnuts and sherry vinegar. 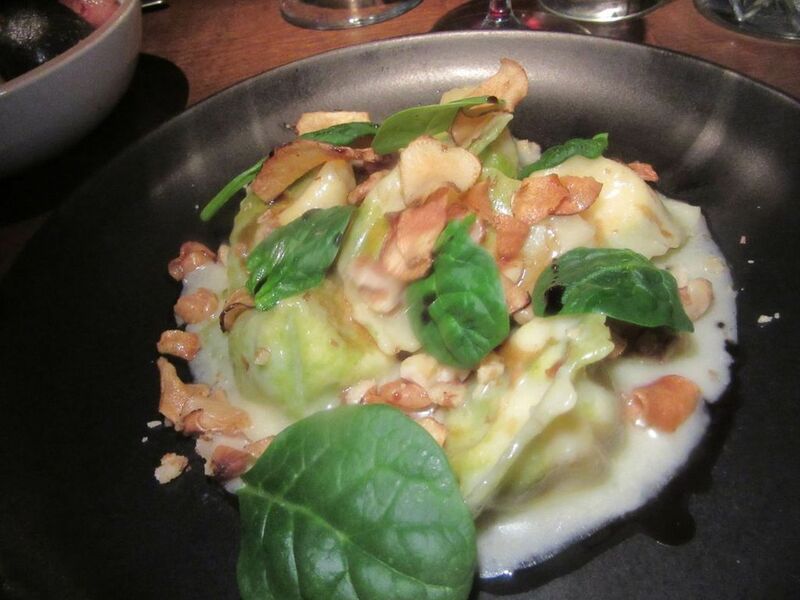 Sunchoke casonsei pasta is ribboned with spinach, walnuts and sherry vinegar. Ham on cheese with a puddle of spunky sauce gribiche is a special on my second visit. Nothing here is totally weird, but then nothing is predictable either. Even a classic roast chicken will have a smart aleck touch, like smoked jus. 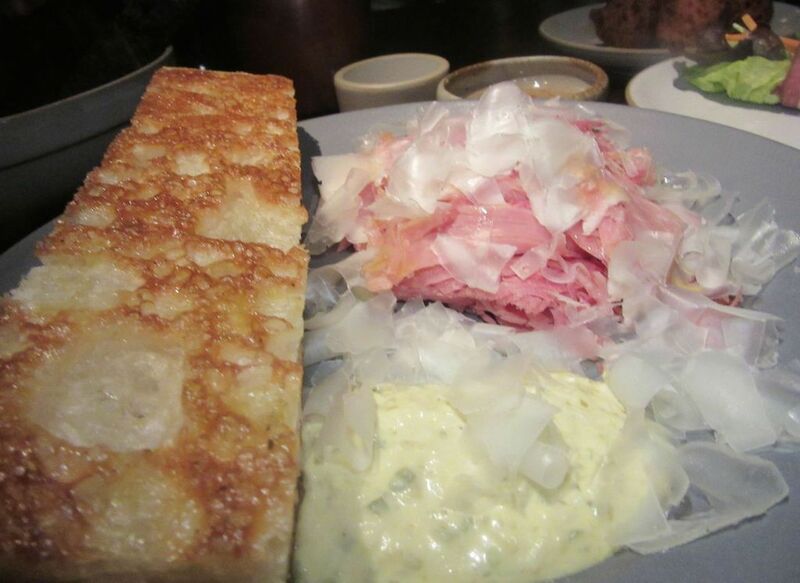 Clearly Stulman’s longtime chef, Matt Griffin, has a fondness for the French classic gribiche, a mayonnaise-style cold egg sauce made with mustard, cornichons and capers, served with cold meats. On my second visit the inevitable gribiche appears with ham and cheese alongside a huge slab of yet another great bread from below. Crunchy vegetable spring rolls are tonight’s amuse. I wish Simon and his Whale were closer so I could buy a loaf of this excellent barley black bread anytime. I’m back with a friend, just two of us, on a Saturday night in April at a table near the window. 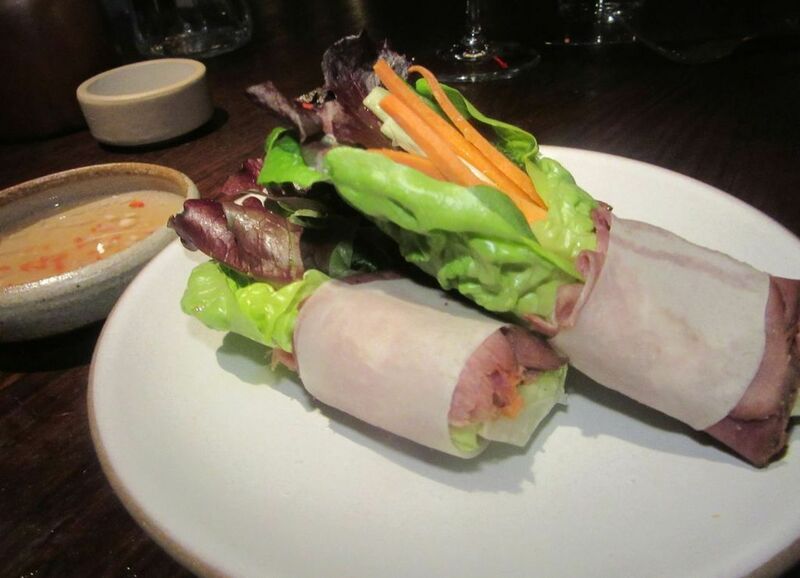 The fish skin crisps are gone, replaced by crunchy vegetable spring rolls as an amuse. The noise in the room is almost unbearable. I don’t recall it being quite so painful on that earlier visit. Maybe this particular spot next to the big window at the sidewalk on 23rd Street amplifies the roar. Simon and his Whale is too far from my home and too deafening to become a goto for me even though I’m drawn by the creativity. 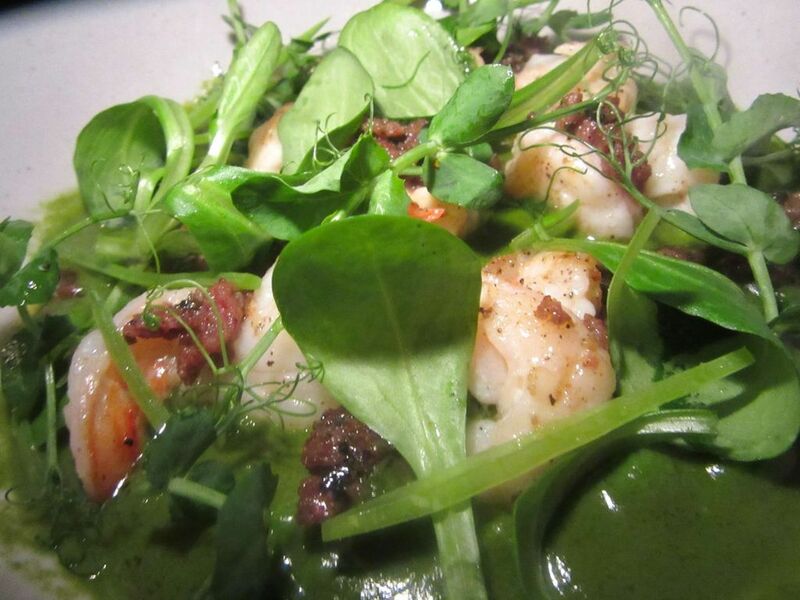 Shrimp with Engish peas, cotechino and fava leaves isn’t merely pretty, it’s good too. I lean in. My pal tries to project as she orders a white wine from the Finger Lakes. 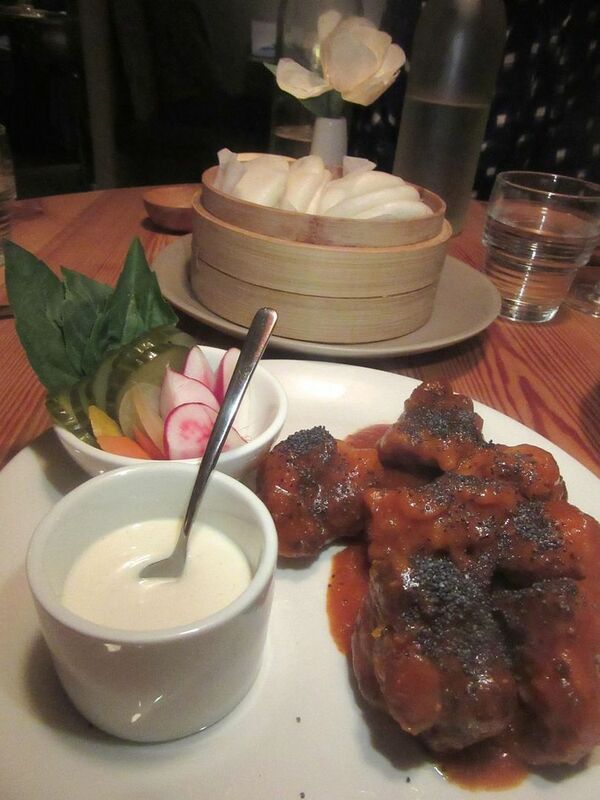 Our server recites the specials, her voice swallowed by the clamor. I don’t think we ordered the zeppole again but here they are. “A gift from the kitchen,” I suggest. I like the chef’s odd congregation of shrimp and English peas with nubbins of cotechino, the Italian pork sausage, and fava leaves among our starters. My spaghetti acqua pazza with baby clams, green Castelvetrano olives and cherry tomatoes is a wonderful tumult of flavors. 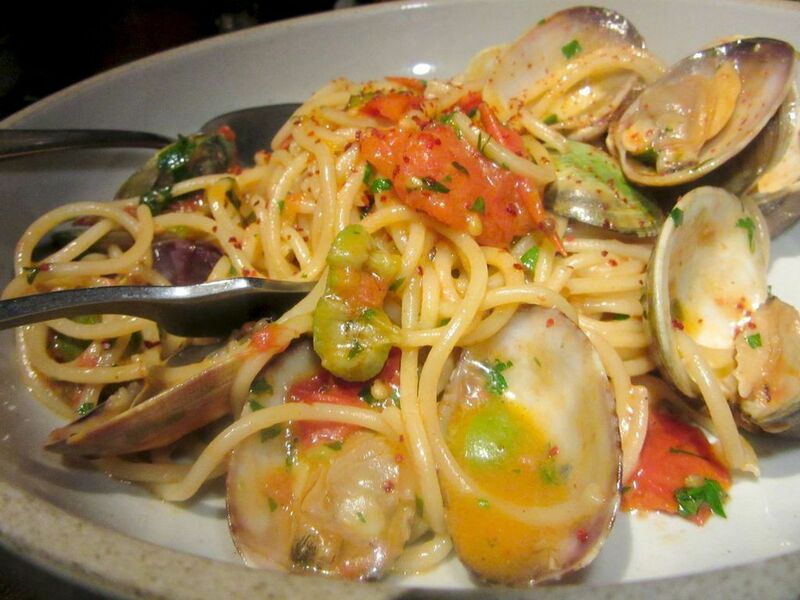 Spaghetti acqua pazza with clams in the shell is a fine tumble of flavors. My friend’s pork collar Milanese, served with aioli and mustard-cured apricots, is a pleasant variation of wiener schnitzel – the meat tender and not dry at all. We ask to take home the leftovers. 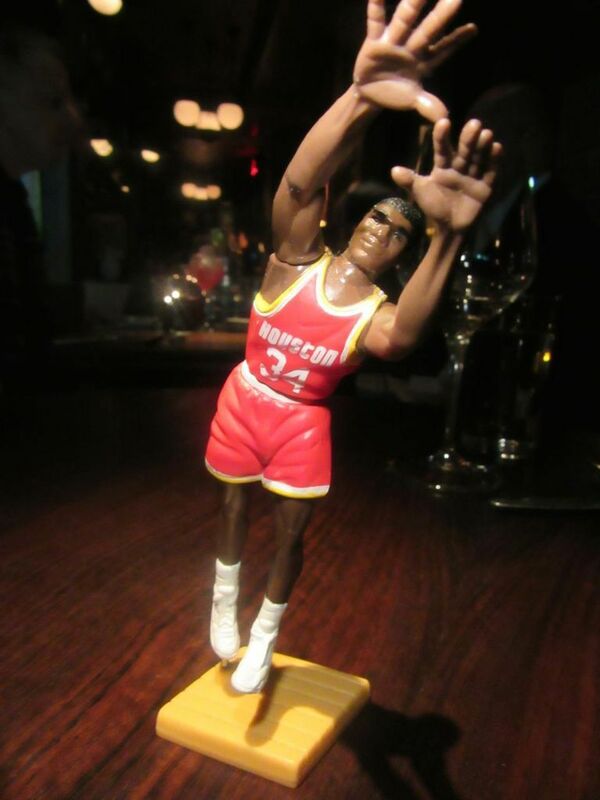 Our server drops a small figure of a basketball player on the table. It’s our marker, she explains, for picking up carry-home sacks at the door. 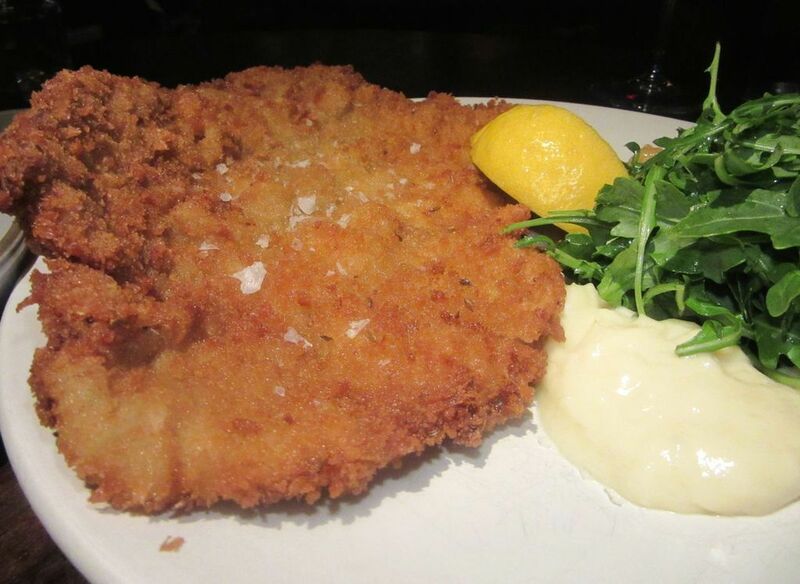 The pork collar Milanese with aioli and apricot mostarda is properly moist and nutty. 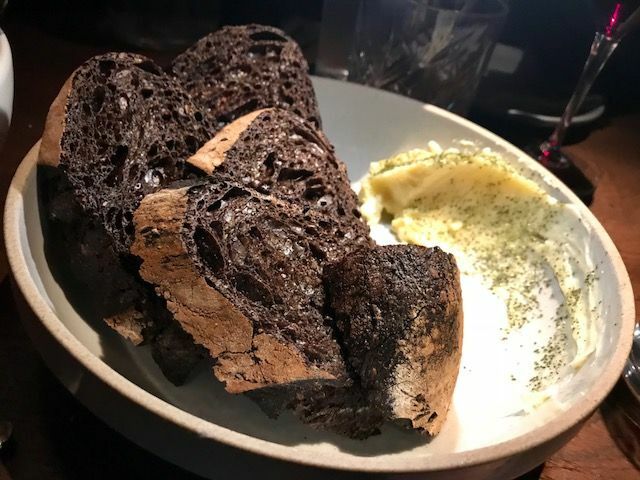 Again, the remarkable black bread is my favorite dish of the evening. I could easily bypass dessert for a few more bites of bread, but my sidekick confesses that she is known in her crowd as a woman who never skips dessert. 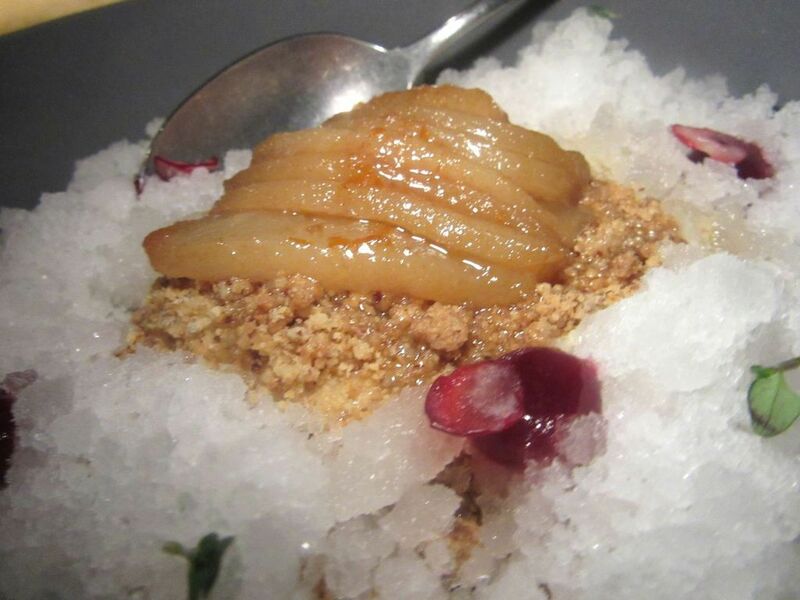 Brown butter-rye pudding with poached pears on pine ice is too exotic for me. 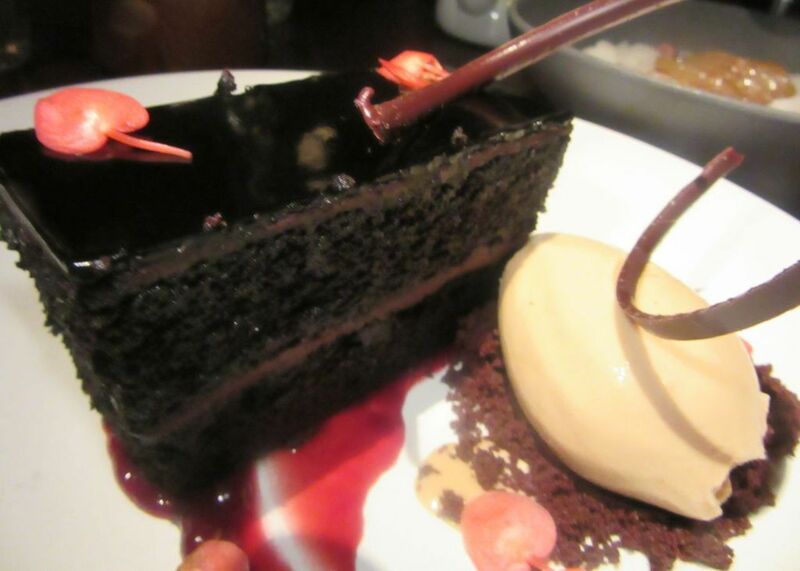 I would never order chocolate buckwheat cake with chicory ganache but it was less offensive than expected. The chocolate buckwheat cake would never be my choice. Buckwheat, chicory ganache and Assam tea ice cream all sound like sabotage to me. Alas, honey-fried pears and cranberry purée are not enough conventional joy to justify the brown butter and rye pudding nested on pine ice. I consider a detour for a hot fudge sundae on my way home. I’m so eager to escape, I don’t notice the charge for zeppole on the check. This little rubber basket ball figure as a marker to pick up leftovers is clever. Let me tell you this about my friend Ariane with her patrician accent. She sprints decorously ahead and leaves it to me to grab the basketball player and claim our leftovers. Sunday is the night I take off from dining out. I often comfort myself with tuna fish salad on a toasted bagel. But this Sunday I will be pleased by a fast sauté of spaghetti acqua pazza, and a crust of black bread warmed in the toaster oven. The Freehand Hotel. 23 Lexington on the NE corner of 23rd Street. 212 475 1924. Sunday to Wednesday dinner 5 pm to 11 pm. Thursday through Saturday 5 pm to midnight.